Forty-six from seventeen publishers have become six from four. There are two previous winners among the nominated authors, and two first-timers (one with their first novel); one woman, and two Americans. 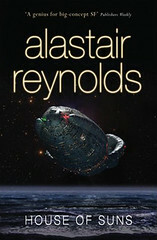 One novel also appears on the BSFA Best Novel shortlist. There are, this year, quite a lot of spaceships. Yes, the Arthur C. Clarke Award shortlist is upon us! This year’s judges — for the British Science Fiction Association, Chris Hill and Ruth O’Reilly; for the Science Fiction Foundation, Robert Hanks and Rhiannon Lassiter; and for SF Crowsnest.com, Pauline Morgan — have deliberated, and decided. That winner will be announced on Wednesday 29th April, at a ceremony held on the opening night of the Sci-Fi London film festival. They will receive £2009, and a commemorative engraved bookend. I make that two awesome books, one okay book, and three books I haven’t read, one of which would never have predicted for the shortlist. Yep, it’s the Clarke Award alright. 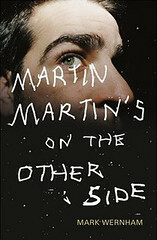 Martin Martin’s on the Other Side but no Gone Away World or Knife of Never Letting GO? I’d also like to say that it would be incredibly tedious and predictable if Anathem won. I really enjoyed your piece on Martin Martin’s On the Other Side and the whole coinage of Barleypunk as you know, so no need to ask about your take on the shortlist there. I’m curious though why you feel Anathem scooping the prize would be tedious and predictable? Also, anyone care to take an early stab at predicting the winner, awesome, tedious or other? probably rubbish and even if it isn’t, if you are going to pick one example of Barleypunk for the list it shouldn’t be this one. I suspect I would find the other three rubbish but I know other (not entirely foolish) people like them so yeah, they can stay. I’m surprised Ness didn’t make it, I thought it was a lock. At least Little Brother isn’t on there. I expected The Gone-Away World to be on the shortlist, but now that I’m struggling to read it I’m glad it isn’t. Didn’t think the Reynolds was award-worthy, and I didn’t think Tepper had written anything for years that wasn’t boringly mid-list. I think the hype and the universal praise surrounding Anathem makes it, as Martin puts it, the Big Beast. I haven’t read the book and have no great desire to so I can’t speak to its ultimate worthiness but I think it makes the world that little bit more interesting when prizes don’t go to the most heavily hyped books. As for the Wernham, I’m surprised more than pleased or vindicated. As I said on the locus blog, I think that when you strip out the social capital considerations, it is certainly comparable to also-rans such as Matter or Saturn’s Children, so while it’s an unexpected choice, I don’t think it’s one that is all that difficult to understand. Abigail and Martin have spoken about how Anathem’s beauty has faded with time but I think Martin Martin has grown on me since I read it. Wow, three of the six from Gollancz and not one from Orbit? Not often they don’t have a contender in there – quite surprised not to see Ken’s Night Sessions in the final shortlist at least. That said, I don’t envy the task of whittling down the choices to only six and at the end of the day we can talk about literary merit as much as we want (and as a bookseller I do that a lot!) but there’s always an element of personal taste in these selections, its inevitable. And whatever our thoughts on the choices it gets us all talking about good books, which ain’t a bad thing. More often than you might think, perhaps. Orbit had no nominees in 2007, 2005 or 2002, while Gollancz have had at least one nominee every year this decade, and supplied the winner for the last three years. Bit of a surprising shortlist; looking back at my predictions, I only got one correct – the Quiet War. It’s also a rather uncommercial shortlist. That one of the books is one no-one’s heard of (Martin Martin’s) and that another isn’t easily available (Song of Time) will make trying to promote it, in some way, that much harder. Anathem is obviously the elephant in the room here. One rather hopes it doesn’t end up steamrollering everything out of sight. The Margarets is also unavailable at Amazon. Er, no it isn’t. 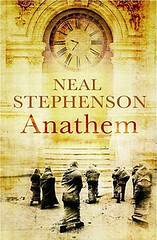 Though it is down to three copies (of the new paperback edition) at the time of writing. Are you looking in the right place? It seems to be available right here. While we’re on the subject of the Margarets, I might as well mention that it’s the most widely available of the shortlisted books in my library system, with 18 copies. 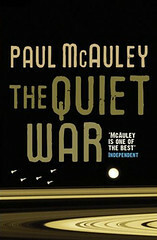 The Quiet War: 13 copies. 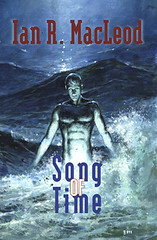 House of Suns: 6 copies (with a further 9 copies of the paperback edition ordered). Eh? Searching for “the margarets” results in this page. Which shows it as out of print. Top tip of searching on the internet: always drop words like “the”, because they are not useful search terms. 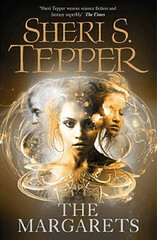 Search term I used in this instance: “Margarets tepper”. 3 of the 6 from Gollancz? I think it might be time to dust down those thoughts about the “Gollancz style”. Jonathan, you mention that you put a comment on the Locus blog; could you give me an idea of when and where so I can make sure it gets pulled out of moderation purgatory? I’m a DBA, so I expect searches for exact titles to return the exact book I’m looking for: SELECT * FROM books WHERE title = ‘The Margarets’. Having said that, Amazon’s search facility has always been pants. raj, from india.i was read clarke award novels.i strogly belived aliens.our next rebirth is in other planets.another galaxies.where that planet aliens lifespan 1000years,or 10,000years,or 100,000years.they lived without polution.they used solar energy(not used petrol,desil)god creates good world’s(not only our worest world)for doing good karma people.